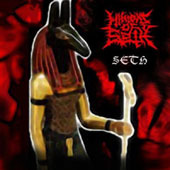 Minions Of Seth was formed in December 2004. Since then band has recorded one live performance (poor production), and had 5 live performances in three cities in Bosnia and Herzegovina. In Visoko happened band's first live performance (that is also recorded), Minons Of Seth played that night with bands Bloodland (Visoko) and Ormus (Sarajevo). Minions Of Seth got through many member changes, first line-up was: Denijal Šahinović, Ermin Habibović, Malik Patak, Elvir Djafo and Jasmin Ajdinović. Then Jasmin Ajdinović, Malik Patak and Elvir Djafo left the band and Senad Kadrić joined. Soon new guitarist was found and that was Eldar Fazlagić. Later on Adnan Čikotić also joined on 2nd guitar.